Just a couple of months after the launch of the HoverCare initiative, Hovertravel have picked up a Bronze award at the Beautiful South Awards ceremony. Hovertravel declare their support for the latest calendar produced in aid of Isle of Wight charity, Wight Brainy Bunch. There'll be extra craft in operation for the Festival so why not apply for a Hovertravel Blue Card and enjoy 20% off fares across the Solent this weekend. Want to get into working in cross-Solent travel? Hovertravel are opening up opportunities for another six apprentices across their engineering, finance and operations departments. Details within. The charity is entirely funded by donations and provides a vital service to those living in Hampshire and the Isle of Wight. 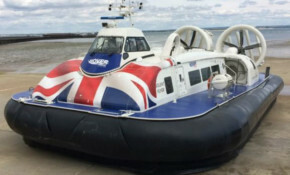 Hovertravel has now become an official partner of the charity. Don't get caught out, check the travel times for Hovertravel over the Christmas holidays before travelling.